Peanut, like most legumes, develops a symbiotic relationship with rhizobia to overcome nitrogen limitation. Rhizobial infection of peanut roots occurs through a primitive and poorly characterized intercellular mechanism. Knowledge of the molecular determinants of this symbiotic interaction is scarce, and little is known about the molecules implicated in the recognition of the symbionts. Here, we identify the LysM extracellular domain sequences of two putative peanut Nod factor receptors, named AhNFR1 and AhNFP. Phylogenetic analyses indicated that they correspond to LjNFR1 and LjNFR5 homologs, respectively. Transcriptional analysis revealed that, unlike LjNFR5, AhNFP expression was not induced at 8 h post bradyrhizobial inoculation. 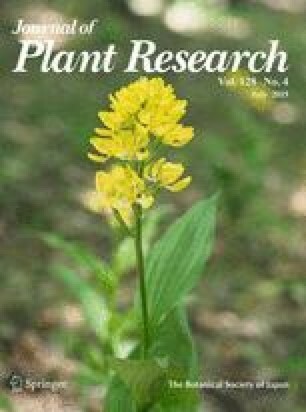 Further examination of AhNFP showed that the predicted protein sequence is identical to GmNFR5 in two positions that are crucial for Nod factor perception in other legumes. Analysis of the AhNFP LysM2 tridimensional model revealed that these two amino acids are very close, delimiting a zone of the molecule essential for Nod factor recognition. These data, together with the analysis of the molecular structure of Nod factors of native peanut symbionts previously reported, suggest that peanut and soybean could share some of the determinants involved in the signalling cascade that allows symbiosis establishment. The online version of this article (doi: 10.1007/s10265-015-0719-6) contains supplementary material, which is available to authorized users. The authors would like to thank Dr. Peggy Ozias-Akins and Dr. Yuofang Guo (UGA, Athens) for performing BLAST searches and providing peanut contig sequences. This study was financially supported by the SECyT-UNRC, CONICET, Ministerio de Ciencia y Tecnología de Córdoba and ANPCyT grants. V. Muñoz and M. Figueredo are recipients of scholarships from CONICET. F. Ibáñez, J. Angelini, M. L. Tonelli and A. Fabra are members of the Research Career from CONICET.